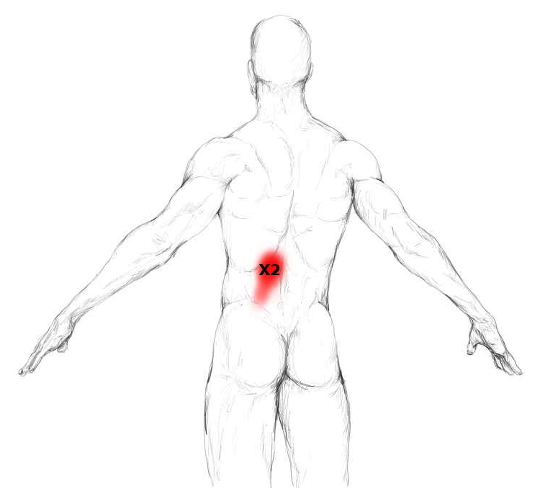 The erector spinae is a main troublemaker when it comes to lumbar back pain. It consists of several muscles – longissimus thoracis, iliocostalis, multifidi, rotatores – and runs on and parallel to the spine. This muscle can be generally divided into two groups – the lateral/outer tract and the medial/inner tract. 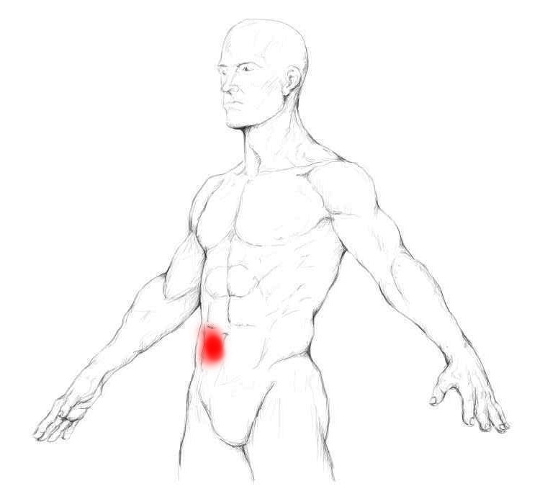 Trigger points in the erector can give you pain all over your entire back and may even send pain to you upper leg and lower abdominal region. 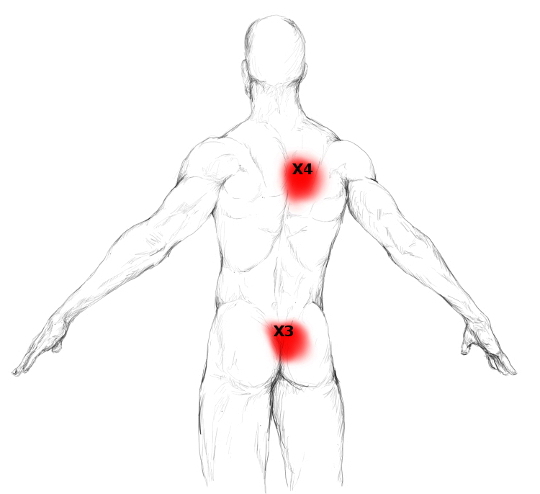 For better localisation of common trigger points, just compare the trigger point number shown in the respective pain zone picture with the trigger point number shown in the muscle picture under attachment points. 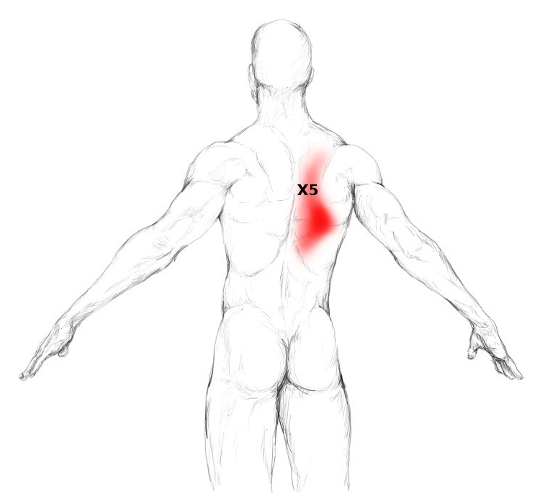 This way you already have a clue where to start your search for tender spots in your muscle. The upper Iliocostalis thoracis can create pain along the medial border of the scapula and in the lower chest. The latter can mimic an acute angina. In case of such pain, always consult your doctor immediately to rule out serious disease. 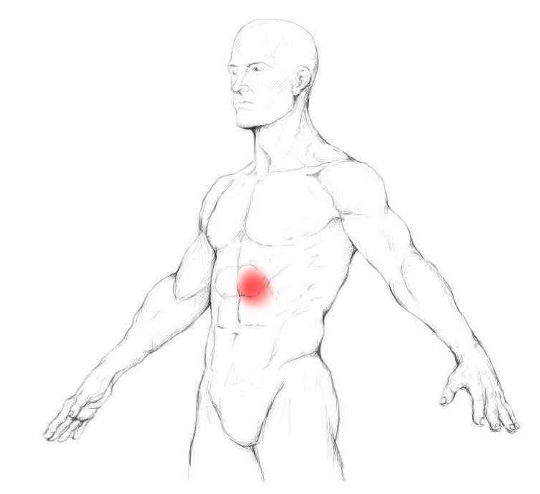 Trigger points in the lower part of the iliocostalis thoracis can refer pain upwards and downwards as well as in the area of the outer abdomen. This part of the erector can refer pain into the region of your lumbar spine and into the buttocks. Often it is involved in unilateral hip pain or a strong lumbago. 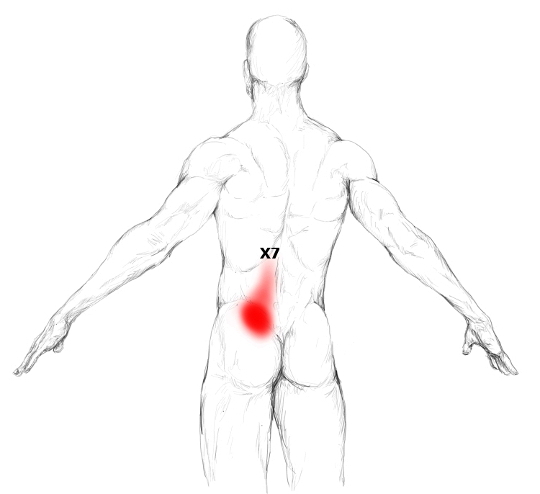 Right picture displays the pain pattern of Trp X6. 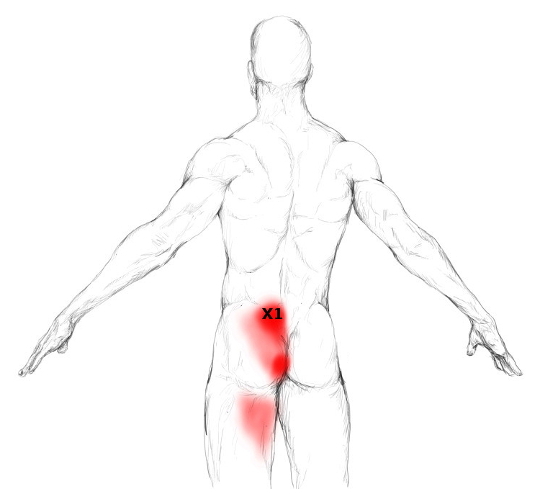 Trigger points in the longissimus thoracis can refer pain to the buttocks as well as to the iliac crest. … area between the shoulder blades. If the erector spinae muscle is too tight or contains tender or trigger points it may limit certain movements or make them highly unpleasant. Bending over the bath tub to wash your hair, or bending over to get that box of water out your trunk might become very painful. Like most of the times, if a muscle is in “trouble” it gives you pain when you exert its function or the opposite movement. In the first case – using it – any contraction/”activation“ will hurt. In the second case the muscle would have to stretch to make a movement happen. For a tight muscle this often is too much. With tight muscles, the nervous system is often highly irritated and works against any elongation/extension of an affected muscle. I will not go into any detailed descriptions of all the muscles. What you need to know though, is that the medial tract runs directly on the spine whereas the lateral tract runs mainly close at the side of the spine and covers the medial tract. So the attachment points of the medial tract are only the vertebras of the spine – not shown here -. The lateral tract attaches at the head, the ribs, all along the spine and at the hip. The picture displays the lateral tract of the erector spinae. The medial tract of the erector spinae mainly stabilizes your spine. A contraction of both sides – left and right from the spine – help to extend/bend your back. A contraction of only one side rotates the vertebras to the other side. But the rotation is not a big movement. It can be seen more as a fine tuning on how your vertebras are positioned. The main rotatory work is done by your abdominal muscles. The lateral part, which consists of considerably bigger muscles, is in charge for “larger” movements. When contracting both sides it helps to keep the body in an upright position and further bends the back backwards. If only one side of your lateral tract contracts, your spine and thus your body gets bend sideways to the same side. Especially bending over and twisting the body can overload the erector spinae muscle real quick. Even with no additional weight – e.g. a water box – this can be already too much as certain fibers of the muscle may get overloaded. Of course, if you carry any heavy object and twist and bend your body, this puts even more stress on the muscle and thus makes it even more prone to get stressed. 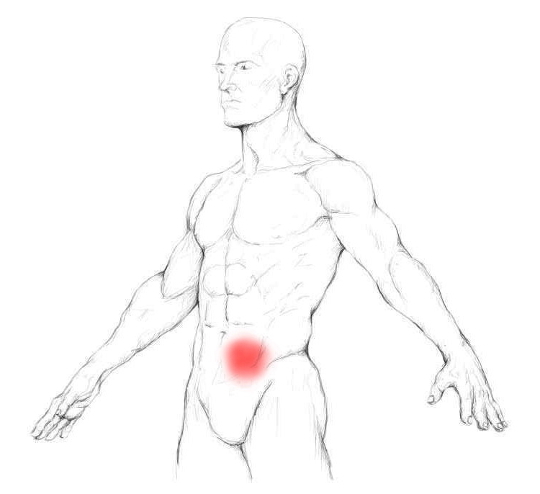 Aside from that, anything that changes the position of your hips a lot or permanently will create lots of stress in your erector spinae and may lead to tender and trigger points. For example limping or sitting on your wallet will tilt your hip, bend your spine and thus influence its corresponding muscles. Feeling the lateral tract of this muscle will be no problem for you. Just put your hand flat on your back and start walking around. With every step you take, you will feel the erector spinae contracting. Also move your hand along your spine and your back to feel the different parts. The medial tract will not be sensible for you as it lies under the lateral tract. Fortunately this is no problem as you will be able to massage it anyway. You will just work through the lateral tract. Massage of this muscle is done best with a massage ball. 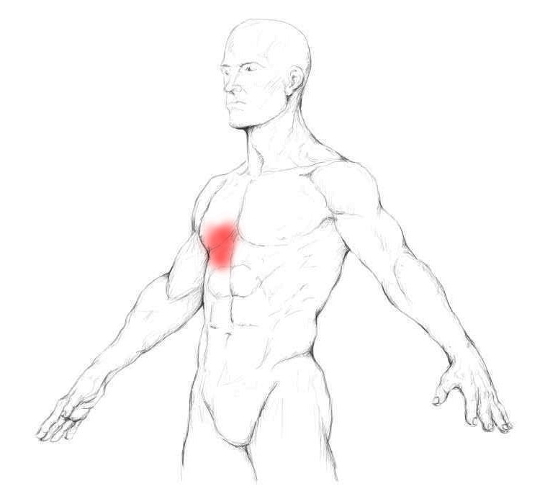 For navigational issues, I recommend using the muscle picture at the top of the site. It will help with deciding on where to massage. I like to massage the erector spinae with a ball. It is really simple and comfortable. Just place the ball on your back at the desired area and then slowly roll over it. As soon as you hit a tender area, stay there and move in a slow and precise manner to get really onto the point. While you are massaging along the muscle you will have to reposition yourself and the ball a couple of times. Otherwise you will not be able to cover your whole back. Did you enjoy this video and my content? 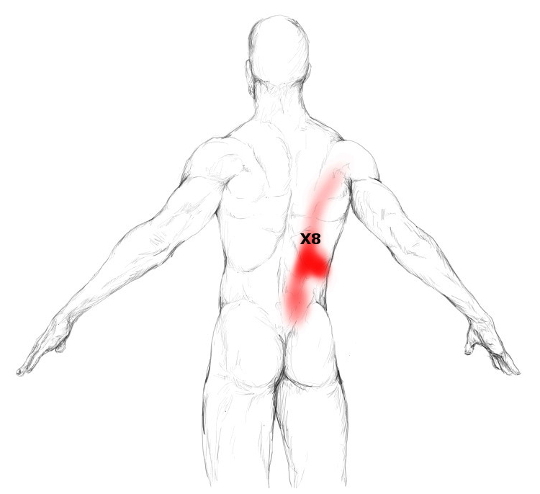 Do you want to know more about trigger points and how they can perpetuate (chronic) pain. Are you looking for answers on how to relieve pain – once and forever? 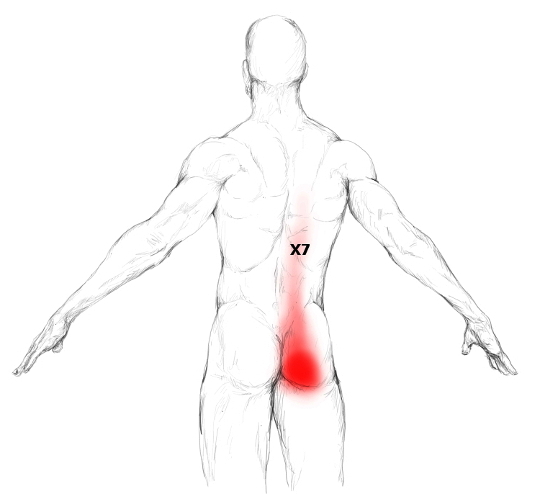 If so, then the free trigger point video course, wich I will send you in collaboration with Dr. Kuttner, is for you. You can sign up below and get started right away.